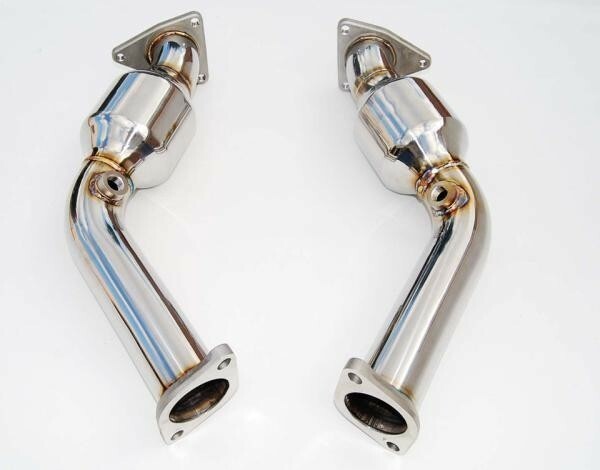 Improve and improve overall engine performance with the Invidia S304 Stainless Steel Test Pipe with High Flow Metallic Catalytic Converter. NOTE: Suitable for VQ35HR and VQ37HR engines only. 1.5mm thick, 60mm diameter, S304 Stainless Steel mandrel bent piping - greatly reduces the risk of cracks and breaks developing, reduces rasp and vibration. High Flow Metallic Catalytic Converter, 200 cells each side - Minimise restriction without removing the catalytic converter all together.